Are My Hardwood Floors Ruined? This is a question many people ask when they have come home to deformed wood floors. The answer varies depending on what caused the damage, how bad the damage is and how long it has been since the problem started. If the cupping is caused by a water flood, they can be dried and returned to normal if action is taken soon enough. 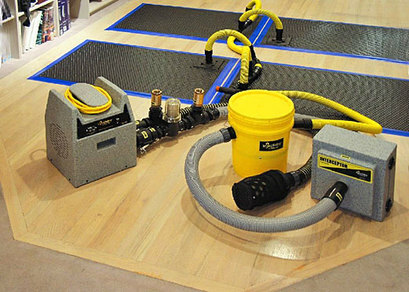 If water is puddling on your wood floor for 24 hrs or longer, your floors will most likely need to be replaced. Stop the flow of water using a shut-off, turn the water off to the whole house if you have to. Wipe up as much water as you can with rags, towels, etc. Call a Water Mitigation Team, 1-800 FastHelp is the best in St. Louis. 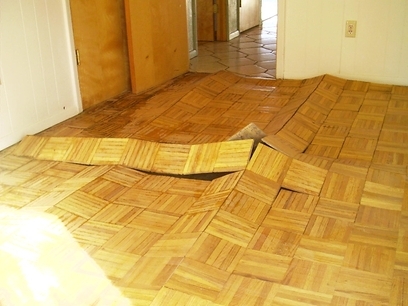 Have us come out and take a look at the damage and assess what needs to be done to get your floors back to their original condition. This was a hopeless case, replacement was required.